Helen Marie Sloup, 81, of Wahoo, NE, entered into eternal rest peacefully at her home on Thursday, April 11, 2019 in Wahoo, NE. She was born August 15, 1937 in Wahoo, NE to Edward and Helen (Busek) Stuchlik. 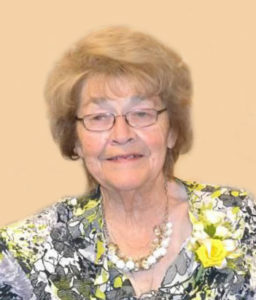 Helen attended District 28 country school and graduated from Weston High School in 1955. On June 11, 1955, Helen was united in marriage to Rudy R. Sloup at St. John Nepomucene Catholic Church in Weston, NE. She worked for Fairview Café for 17 years, J.C. Penny’s for 10 years and over 30 years at Wahoo Warehouse Surplus and Nebraska Bridal Outlet. She is survived by her sons, Rudy (Betty) Sloup of Fort Gratiot, MI, Bob (Nancy) Sloup of Wahoo, Joe (Teri) Sloup of Lincoln, Tom (fiancé, Laurie Loseke) Sloup of Columbus, Dan (Ginger) Sloup of Wahoo, and Bil Sloup of Wahoo; 21 grandchildren and 15 great-grandchildren; brother, Larry (Betty) Stuchlik of Lincoln; sisters-in-law, Lorene Stuchlik of Weston, Agnes (Don) Kasper of Omaha, and Karen (Neal) Barry of Weston; brother-in-law, Harvey (Loretta) Sloup of Omaha; many other family members and friends. She was preceded in death by her parents, Edward and Helen Stuchlik; sister and brother-in-law, Charlotte and Jim Sousek; brother, Edward Stuchlik, Jr.; great-grandson, Gavin Murphy. My deepest sympathy in the loss of your lovely wife, mother and grandmother! I’m grateful to have known Helen, always enjoyed being with her. May god grant you extra strength during your sadness! we will miss going to Wahoo and not seeing Helen. Our heartfelt sympathy to all your family. Aunt Helen was my godmother. I will remember the time my brother & I came to stay during the summer to walk beans. They will be greatly missed. Helen was one of the nicest people I have met in Wahoo. She always was honest and generous with her time to visit. I’m so sorry for your family’s loss of 2 of the greatest people I knew in Wahoo. So sorry for all of you. Thay have left a great legacy. So sorry to hear about the loss of your parents. Losing one is not easy, but both within hours of each other is horrific. There is comfort in knowing that they are together with their Lord. We enjoyed visiting with Helen a few years ago when we were in Wahoo. She was so proud of her children and their accomplishments. God bless. Connie (daughter of Geraldine Busek Barry). Helen’s granddaughter, Shay, has been tell our entire office stories about her amazing grandmother for months now. I’m so sorry to hear of her passing. Your entire family is in my thoughts and prayers. So sorry to hear of your loss. They were a wonderful couple and will be missed by many. My visits to the Warehouse will never be the same, without Helen to visit with. Joe and Terri, I am so sorry for your loss. May God grant you comfort. My deepest sympathy go to the entire family for the loss of Helen and Rudy. Take peace in knowing they are eternally together.